Muslims believe that the Qur’an was revealed to mankind as clear guidance, based on an objective meaning – commands intended to be understood and applied by us. There cannot be unlimited interpretations of the Qur’an because, for the Qur’an to have any meaning, this necessitates discernment between things (unless the author is a poor communicator). However, there are some who prefer to describe the Qur’an as entirely “subjective”, allowing them to disregard those commands that are not to their liking, and “read” into the Qur’an whatever they feel they would like it to mean. A Muslim reads the Qur’an as containing deliberately chosen words. 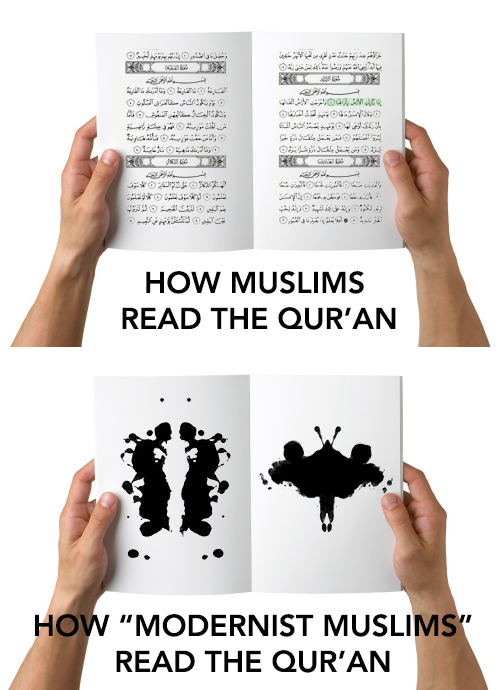 A “modernist Muslim” reads it as an inkblot test, random ink splashes on a page, projecting their own desired meanings onto it. « TICKET RESERVATIONS NOW LIVE: Islam or Feminism – which one can truly liberate women?